Source: Excerpt from the book “The Olympic Deceit of the ‘Divine Baron’ – Pierre de Coubertin”. The reference is made to the fascist Japan. Another great gesture of the IOC! 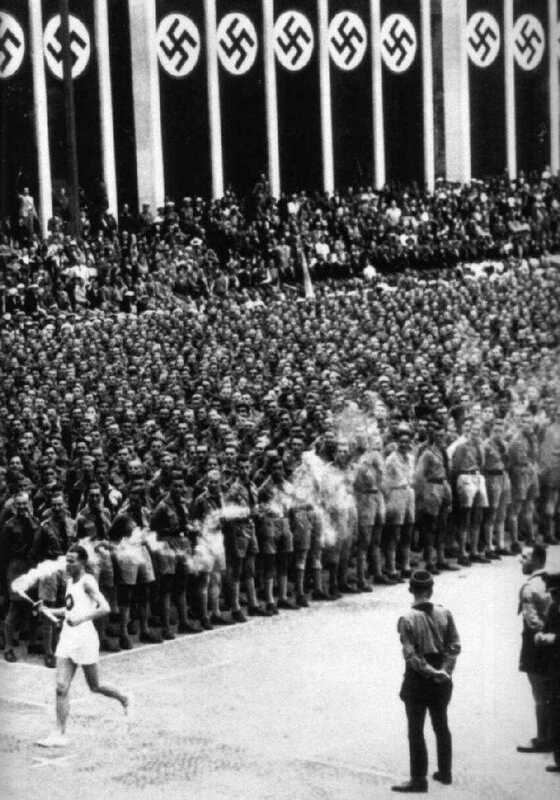 When speaking of the “perfidious attacks” on the Nazi Olympic Games, Coubertin was also thinking of the attempt on the part of members of the international brigades, the Spanish republican combatants, to organize the “Olympiada popular” in Barcelona in July 1936 as a response to the Nazi Olympic Games. The troops of fascist General Franco prevented these “Peoples Games” being held. "The Games are perverted? 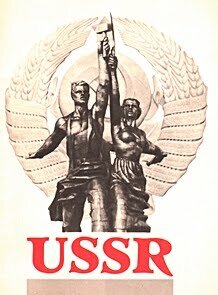 The Olympic idea is sacrificed to propaganda? That is utterly untrue. The magnificent success of the Berlin Games served perfectly the idea of Olympics. Only the French, or almost only the French, are playing Cassandra..."
Coubertin had a special reason to be enthusiastic about the Berlin Games. The organizers of the Games had a giant bell casted and decorated with the figure of an eagle, not a very friendly looking one, holding the Olympic circles in his claws. At the rim of the bell there was a message : "Ich rufe die Jugend der Welt" ("I invite the youth of the world"). The Olympic Stadium in Berlin thus became a kind of a modern shrine in which the most spectacular of all the religious rites of the New Age was to be performed - the Nazi Olympic Games. This was the incarnation of the ideas Coubertin fought for all his life. Anyhow, Carl Diem was proud of "his" Olympics all his life and emphasized its "artistic programme". Unfortunately, on Coubertin's request, this programme contained Beethoven’s "IX symphony", used as a cover for this fascist festival of death. Following the same principle, the concentration camps may be described as "educational institutions", since the members of the "lower race" were welcomed by music and the camp gate bore the inscription : "Arbeit macht Frei!" 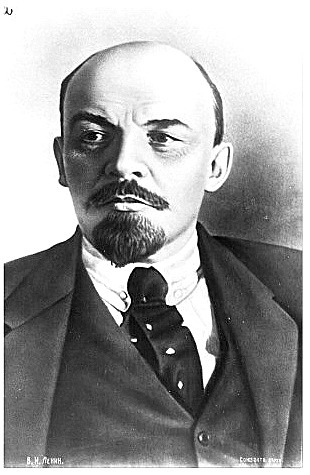 ("Labour liberates!"). Hitler's decision to keep the Olympic Games in Germany forever was one of the motives for such an initiative by Coubertin. After the Berlin Olympics, Hitler gave a customarily megalomaniacal order to his architect Albert Speer to design plans for a new Olympic Stadium (Nürnberg), for more than 400 000 people, due to be finished by 1945. This is a part of the explanation why "the great French patriot" Coubertin, who concluded his early works with a cry "Vive la France! ", bequeathed his works to the fascist Germany, the biggest enemy of the French. 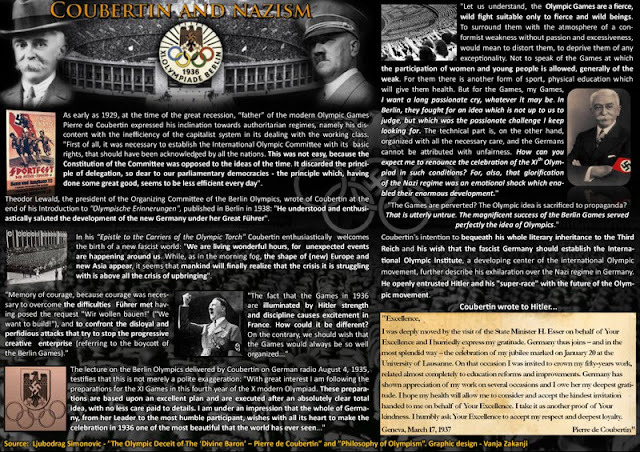 Coubertin saw Hitler and his fascist regime as a possibility to incarnate his own philosophy completely. Hitler's conception "Wir wollen bauen! 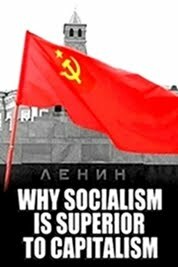 ", the practice of the fascist regime, made the perfect affirmation to Coubertin that his deed and his ideas would live in future. As far as the question "Did he know of the fascist crimes?" is concerned, it must be pointed out that Coubertin, while living in Switzerland, had an opportunity to closely witness these misdeeds. Besides, the Nazis started building concentration camps right after they came to power, and without any discretion. There are other details of Hitler's "constructing" design that Coubertin unconditionally supported, at the same time fervently attacking the opponents of Hitler's regime. The brutal elimination of the members of the SA troupes on June 30, 1934 ("The Night of the Long Knives") ; the persecution of the Jews, culminating in Nurnberg Laws of the Race on September 15, 1935, according to which the Jews were deprived of civil rights (Hitler's idea first announced in the "Programme of the National-Socialist Party" in February 1920) ; the persecution and murders of the workers and opposition leaders. On March 16, 1935, Hitler announced the rebuilding of the German war machine; on March 7, 1936, only a few days after the Winter Olympic Games at Garmisch-Partenkirchen, Hitler's troupes entered the demilitarized Rhine zone, overtly breaking the international agreements and defying (Coubertin's "beloved") France. 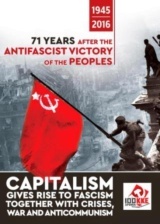 At the same time, fascists systematically destroyed all the world's cultural inheritance opposing their ideology. The masterpieces of world's culture were burnt on monumental bonfires. I was deeply moved by the visit of the State Minister H.Esser on behalf of Your Excellence and I hurriedly express my gratitude. 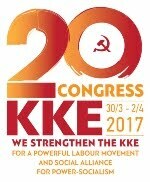 Germany thus joins – and in the most splendid way – the celebration of my jubilee marked on January 20 at the University of Lausanne. On that occasion I was invited to crown my fifty-years work, related almost completely to education reforms and improvements. Germany has shown appreciation of my work on several occasions and I owe her my deepest gratitude. I hope my health will allow me to consider and accept the kindest invitation handed to me on behalf of Your Excellence. I take it as another proof of Your kindness. I humbly ask Your Excellence to accept my respect and deepest loyalty. The IOC wanted above all to acquire the formal cover in public for the Olympics being held in Nazi Germany – to prove that the Olympic movement as well as the Berlin Games "had nothing to do with politics". 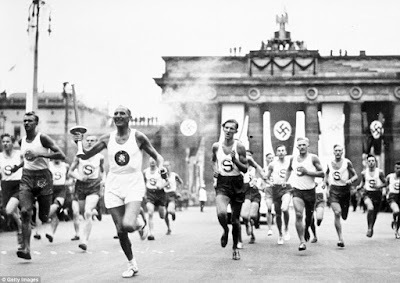 The "details" about the participation of the Jewish contestants at the Games, as other facts demonstrate – Baillet-Latour asked Hitler to remove the anti-Semitic posters from the road to the Berlin airport; he also asked the German government to obey the Olympic Declaration and let the Jewish contestants be part of the German team. The worst of all was the fact that the acknowledgements of the formal conditions were used as evidence that "everything is well" in fascist Germany and that there are no persecutions because of race or conditions. The IOC practically supported the Nazi regime and allowed it the international credit. And that is not all. 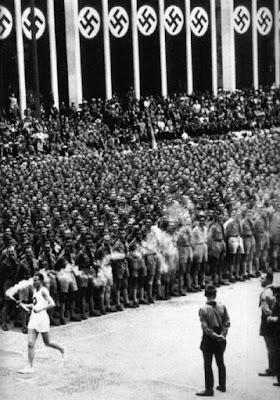 When fascist Japan refused to organize the Olympic Games in 1940, due to be held in Tokyo – in order to advance freely against the Chinese people and prepare the Far East campaigns – the IOC frantically tried to find a country willing to organize the Games on the eve of the War. After searching in vain, the IOC addressed the Nazis. Hitler was once more asked to prepare the Winter Games in Garmisch-Partenkirchen. This was another opportunity for him to prove to the world that the Nazi regime wishes above all "peace and collaboration between the peoples of the world". Besides, it suited Hitler's plans to move the Games to Germany permanently. He accepted the offer. But soon, for the same reasons as Japan, Germany gave up organizing the Winter Games. Carl Diem spoke once more on behalf of the Nazi regime. The Berlin Games were the competition between the fascist regimes (Germany, Japan, Italy) and the “democratic” systems (USA, Great Britain, France). The fascists triumphed : Germany did better than the United States for the first time in history; Japan beat England, an Italy won more medals than France. The fascist fanatics saw it as providence and the war could begin. During World War II the Belgian Count Baillet-Latour, Coubertin's heir as President of IOC, made plans for "the future" of the Olympic movement in the Nazi "New Order" with Hitler's men – Diem, Lewald, Hans von Tschammer und Osten. All this, of course, according to the principles of "peaceful collaboration among peoples"! The real nature of the IOC is illustrated by its structure after the War. First the German Karl von Halt: He entered the IOC in 1929. He held the rank of SA Gruppenführer. After the War he was accused of being a war criminal. He was saved by Avery Brundage's personal influence. Karl von Halt not only stayed in the IOC, but was also promoted to The Executive Board in 1957. (In 1951 he became president of the West-German Olympic Committee.) A similar destiny is shared by the French Marquise Melchior de Polignac. He entered the IOC in 1914. He spent six months in a French prison as a fascist collaborator. He also stayed in the IOC as a member of The Executive Board till 1950. (31) Both Sigfrid Edstrøm, the first President of the IOC after the War, and Brundage insisted that the Italian fascist Count Paolo Thaon di Revel should also keep his membership on the Committee. He entered the IOC in 1932 and was elected to the Executive Board in 1954. By the same rule the IOC kept Count Alberto Bonacossa, Mussolini's follower, in the IOC from 1925, and on the Board from 1952. 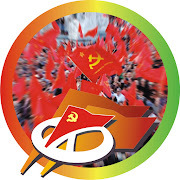 (32) It seems that the main condition to enter the IOC is to be a member of the fascist movement! Brundage was the one to introduce Juan Antonio Samaranch to the IOC in 1966, as a man “whom he trusted and loved”. Two years later Samaranch was appointed Chief of Protocol, and in 1970 Brundage introduced him to the Executive Board. The biggest shortcoming of Vyv Simson’s and Andrew Jennings‘ book about Samaranch, “The Masters of The Rings”, is that it exclusively deals with the sport of our times and starts from a premise that “only a decade ago it was a source of beauty and purity”. Firmly holding to this absurd belief, the authors fail to properly analyze the history of the modern Olympic movement. 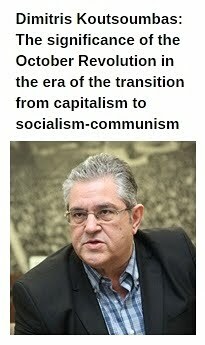 Without this analysis it is impossible to explain how one of the leading fascists of Spain became the president of the IOC. Had they spent some time investigating the political biography of Avery Brundage they would have realized that Samaranch didn’t win Brundage’s trust by doing him small favours, but precisely because he was an orthodox fascist. Samaranch was a real Brundage man. Brundage knew very well that Samaranch was a high ranking member of the fascist regime in Spain and that he was responsible for bloody oppression in Cataluña. Brundage was not bothered by the fact that Samaranch, as a member of the IOC, publicly displayed his fascist beliefs and wore his fascist uniform while marching in the streets of Barcelona, then went on to speak about Olympic “ideals”. Having this in mind, it becomes clearer how in 1965, of all places, the IOC chose fascist Madrid to hold its general assembly, which was chaired by General Franco! As the masters of the Olympic movement always liked to point out, sport and especially the Olympic Games had “nothing to do with politics”. This was, after all, confirmed by Franco himself. Chairing the IOC assembly, he did not speak about politics (he offered the American government to set up military bases in Spain) but about his “loyalty to Olympic ideals”, about “peace”, “international cooperation”… and for it he was rewarded with a huge ovation from the gentlemen of the IOC. That‘s the way fascist dictator Franco became, shoulder to shoulder with Coubertin, Baillet-Latour, Diem, Hitler, Goebbels, Mussolini and Brundage, a part of “glorious” Olympic history. It was enough to speak about Olympic ideals to turn the world’s biggest criminals into Olympic angels! The “cunning chameleon” Juan Antonio Samaranch realized this in time. By preaching holy Olympic prayers of “peace” and “international cooperation”, this “hundred per cent Francoist”, as he liked to call himself among friends, was transformed into a messenger of peace and welcomed everywhere. After the Olympic Games in Barcelona, the Spanish King decorated Samaranch with the title of Marquise. It seemed that fascist Samaranch, after the Barcelona Games, repaid the debts for his crimes. 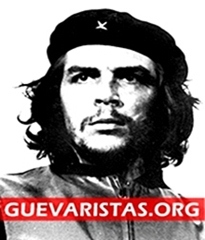 Citizens of Spain, who lived through the years of the criminal regime, were not deceived by the “cunning chameleon”. For them, as with the rest of the freethinking world, he remained what he always was, a fascist. The “cunning chameleon” changed his colours but his nature stayed the same. In order to deceive the world public and create himself a new image to suit the position he was now occupying, Samaranch omitted from his biography that he was a (fascist) member of the (fascist) parliament (Cortes) of Spain; member of a (fascist) city council in Barcelona; president of the (fascist) regional council of Cataluña, and even that he was appointed minister for sport (by Franco). The IOC propaganda service was like everything else in the IOC under Samaranch’s control. 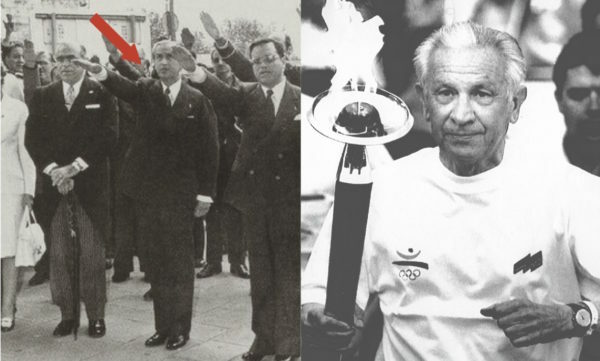 It aimed to create a myth about Samaranch: “He is a decent man who has dedicated his whole life to the Olympic movement” – according to one of the propaganda pamphlets manufactured at the IOC headquarters in Lausanne. 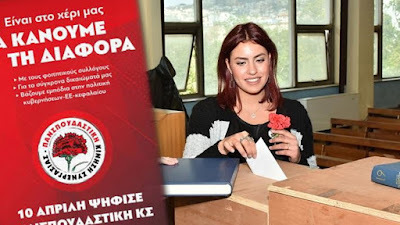 The situation is changing all the more as the obdurate representatives of totalitarian regimes are being replaced by pragmatic “new boys” who are first and foremost interested in money. This is logical, for fewer and fewer national flags and more and more flags of multilateral companies are flying over the Olympic arenas. The Olympic Games have become a huge hoarding for advertising multinational companies. In this context the question arises as to the meaning of the famous maxim that “sport has nothing to do with politics”. For while sport was in the hands of bureaucratic clans it was constantly stressed that “sport must be cleansed of politics”. This was the sacred formula to solve all problems. Where are those “humanists” now when the Olympic gentlemen are literally selling the Olympic Games to capitalist concerns? What has happened to the “struggle against the manipulation of sport and sportsmen”? Where is their “freedom-loving” word now? “Freeing sport from politics” is thus becoming the struggle for the unlimited freedom of capital in sport. The present day Olympic torch, which was first carried by aristocrats and then handed over to fascists and then to cold-war hawks has ended up in the hands of Olympic merchants. Those who swear most strongly by Coubertin have dug the grave for his Olympic idea. Diem-Institut, ed. pub. and copy 1967 by Ver. Karl Hofmann, Schorndorf, Germany. (2) Baron Pierre de Coubertin, Olympische Erinnerungen, Wilhelm-Limpert Verlag, Berlin, 1938. Introduction, page 6. (3) Pierre de Coubertin, "The Philosophic Foundation of the Modern Olympics", In: The Olympic Idea, page 130, 131. (4) Pierre de Coubertin, "Speech by Baron de Coubertin at the Close of the Berlin Olympic Games", Ibidem, page 135, 136. (5) From: “Internationale Sportrundschau”,n. 7,1936, p.189. In: Jean-Marie Brohm, Jeux Olympiques a Berlin, Editions Complexe, Bruxelles, 1983, p.205,206. (6) After Hans Joachim Teichler, "Coubertin und das Dritte Reich”, Sportwissenschaft, 1982, 12, page 35, 36. (9) Richard D. Mandell, The Nazi Olympics, Souvenir Press, London,1972, page 147. (10) Carl Diem, "Olympische Akademie", Dortmund, 1961, page 17-20. Carl Diem, Der Olympischen Gedanke, Carl-Diem-Institut, Köln, 1967, page 127. (11) Albert Speer, Inside the Third Reich, MacMillan, New York, 1970, page 70. (12) Arthur Morse, ibidem, page 156, 157. (14) Teichler, ibidem, page 43. (21) Ibidem, page 32, 33. (26) After Peter Hein, "The Politics of Sport and Apartheid", In: Sport, Culture, Ideology, ed. Jennifer Hargreaves, Rutledge, London, 1982, page 233. (27) Mandell, ibidem, page 236. (30) Speer, Ibidem, page 72, 73. (31) Allen Guttmann, The Games Must Go On, Columbia Uni. Press, 1984, pages 101,265,267. (32) Ibidem, pages 101, 267. (33) Ibidem, page 102, 268. (34) Ibidem, page 92, 264. (40) Le Comité International Olympique, Lausanne, Suisse, 1984, pp 25. 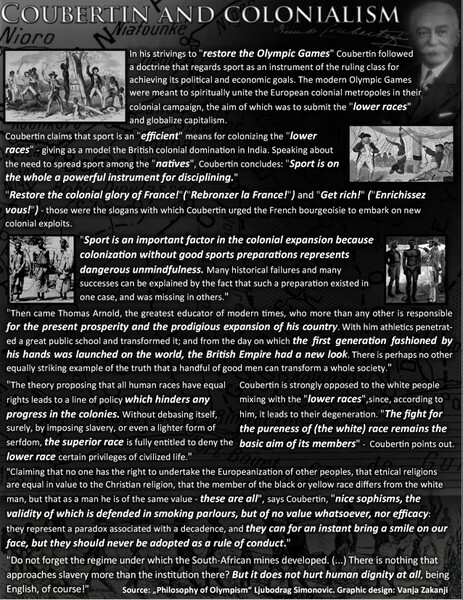 About the same issue see also: Jean-Marie Brohm, Jeux Olympiques a Berlin, ed. Complexe, Bruxelles, 1983; Hajo Bernett, Nationalsozialistische Leibeserziehung, Karl Hofmann Verlag, Schorndorf bei Suttgart, 1971; Hajo Bernett, Sportpolitik im Dritten Reich, Karl Hofmann Verlag, Schorndorf bei, Stuttgart, 1971; Carl Diem, Olympische Flamme, Utscher Verlag, Berlin, 1942; Carl Diem, Weltgeschichte des Sports, Cotta Verlag, Stuttgart, 1971; Carl Diem, Der Olympische Gedanke, Reden und Aufsätze, ed. Carl Diem Institut, Köln, 1967; Berthold Fellmann, 100 Jahre deutsche Ausgrabung in Olympia, Prestel-Verlag, München, 1972; Arnd Krüger, Sport und Politik, Fackelträger Verlag, Hannover, 1975; Karl Adolf Sherer, 100 Jahre Olympische Spiele, Harenberg, Dortmund, 1995; Judith Holmes, Olympiaden 1936, Hitlers propagandatriumf, Aldus, Stockholm, 1973; Peter Hein, "The Politics of Sport and Apartheid", In: Sport, Culture, Ideology, ed. Jennifer Hargreaves, Rutledge, London, 1982.